Home→Feature→Why Did God Create Lucifer? ← Did God Create the Devil? If God is all-knowing, He must have known that the beautiful angel Lucifer would sin and rebel against God’s government. So why did God create Him? Can we visualize a scenario of God starting to create Lucifer then seeing that He would start thinking of self, saying, “Oops! Not this one!” and trying another version … and another … and another … till He saw one that wouldn’t sin?? If God began to create someone but trashed that angel when He saw that he would sin, would He really be allowing free will? Now let’s consider why free will is so very important. We may all be disappointed at times in the behavior of loved ones. They hurt us. They betray us. They say unkind things to us. But consider the alternative: All our family members and friends are programmed to only say kind things, to be unfailingly loyal, etc. They have no choice but to “love” us! Is love without free choice even possible? I don’t think so. I think love is possible only if there is a choice not to love. What about you? Love is meaningful precisely because it cannot be forced. It is meaningful precisely because it is a choice. Our friends, mates or lovers don’t have to love us, but they do. And that is what is so exquisitely satisfying! My husband loves me! My daughter loves me! Conversely, no one compels me, but I choose to love my husband, my son, my friend. Etc. etc. I believe that freedom of choice is of infinite importance to God because He wanted a love relationship with the angels and people He created. He wants a relationship with people who can reason with Him. (Isa. 1:18) That’s why He took the awful risk of giving us free will. Furthermore, Christ’s death on the cross demonstrates how important free will is to God. It was a terrible price to pay. In the process, Christ risked heaven itself, because He could have failed. He willingly took the chance of never seeing heaven again, of never again being adored by all the holy angels, of never again feeling embraced by the Father’s love, of never again experiencing the sweet harmony of infinite love – all because He values a love relationship with you and me. You see, God could technically have dealt with the sin problem a different way. 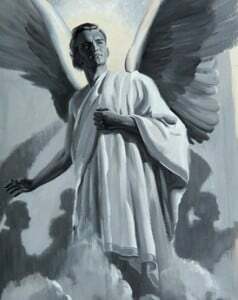 If He had just zapped Lucifer out of existence when he began to sin, the other angels would have served Him out of fear, and that would have spoiled the love atmosphere of heaven. But what if He zapped Lucifer out of existence and then created another beautiful angel just like Lucifer and modified all the angel memories so they wouldn’t know that He had zapped Lucifer out of existence? Technically that would have left the loving atmosphere of heaven intact, wouldn’t it? The angels wouldn’t know what God had done. That should make us think seriously about what it means to be a Christian, what it means to serve God. Is a love relationship all about following a set of rules? Do you judge your relationship to a loved one by checking off a list of rules? Do you feel loved if you give your loved one a set of rules to check off, and that person checks off every rule for the day? Who has the heart? With whom are our thoughts? Of whom do we love to talk? Who has our warmest affections and our best energies? As Seventh-day Adventists we have often placed much emphasis on the law and preached the law until our souls are as dry as the Atacama desert that has no dew and goes without rain for years. But the Law of God is only intended to show us what love looks like in action. If we love God supremely, we will naturally keep the first four commandments, and if we love our neighbors as ourselves, we will not harm our neighbors in any of the ways described in the last six commandments. On the other hand, if we conform to the outward demands of God’s Law but do not love God supremely and our neighbors as ourselves, we have missed the whole point of the Law. And we are missing a relationship with Christ. To get back to our beginning point: God created Lucifer in spite of knowing that he would sin because He values a relationship with His created beings so much that He was willing to take on the risk of eternal loss so that He could have a forever relationship with the beings He had created. God wants a love relationship with you and with me! And we can have it this very moment by surrendering ourselves to Him and choosing to trust Him completely. Inge Anderson is the publisher of Sabbath School Net. A retired teacher, she writes from British Columbia, Canada. I seriously needed to read all this as I'm struggling with very serious health issues and pain that's driving me to dark thoughts, angry at God for creating me or allowing me to live thru several close brushes with death. My parents both seriously crazy, taught me that God was all punishing, ready to pounce on me the moment I mess up. I was just 17 yrs old, was abandoned, rejected and tossed out to fend for self in 1969 Loma Linda after the flood, NO ONE CARED! at 14 I was kidnapped, drugged, raped by 45 yr old "man" kept for 2 nights. Each time my mom said was my fault. I didn't even receive a hug. That God was angry with me for something wrong that I did...that what she taught me about God. After that I had 3 more serious attempts on my life. Then an AVM caused severe anemia 3 yrs. Dr Ted Mackett found, fixed it, amazed I'm alive. But the stress of growing up being raised by two crazies has taken a toll on my health and I truly am suffering pain. 2 torn rotators, torn biceps, blown knees. GOD...ENOUGH already! WHY? WHY ME? Many nights my prayer is for the Lord to take me in my sleep. Not a good prayer for a woman just 63 yrs old. But I'm not handling this pain and wonder how much longer will God allow my suffering. Wasn't my having a horrible child hood enough? And every year something really bad happens. If God knew me before I was formed then WHY wasn't I one of the many miscarriages my mother had. Why did God allow me to be born? To suffer a lifetime of pain? What is the point? You've surely had a tough life and still do. God's promise still holds true for you because He hasn't given you more than you can bear. Another person may have already lost their mind, but you are still talking to God! You are having a Job experience and someday, maybe not in this life, you'll understand why you were tried so long in the fires of affliction. There is no easy answer, but I know that whatever the human experience GOD IS STILL LOVE. And he proved that on Calvary a long time before you were even born. I empathize with your human feeling, and pray that your faith fail not. Reading your comment my heart goes out to you, it is clear that things has not gone according to God's plan for your life. However when I get to the bottom I see that you are not as young as I imagine but clearly not as old. In life things happen to us which has never been a part of God\' master plan for us, but for every situation in our lives God is there. The poem Foot prints in the sand, tells me You have never been a lone, your mere excistance is a testimony that God has never forsaken you. Your pain are real, your suffering are real but there is a balm in gilead who will heal our suffering sole. As we use our lives to reach out to those in similar situation like ourselves, we become healed. My prayer to you use your stepping stones of life for others. It is in giving that we receive, God bless you my sister in Christ. Cheryl, I am truly sorry for the pain that you had to endure and are still suffering from to this day. The pain that you are feeling is not just physical and when we do not get treatment for our past hurts this can manifest to the pure physical pain that you are feeling today. I don't know why God causes some of us to endure all that we do, just as I don't understand why God created a being that has caused so much destruction. If God is all knowing why was Satan even allowed to take his first breath? Your first step to living a life free of pain is to find someone to help you get through your past trauma. Not just anyone you need someone who specializes in childhood sexual abuse. Please seek out that help, it will help you start living a life of purpose. Sister Cheryl, Job went thru a tough time but he lived to see God's restoration of health and wealth. Pray everyday and never ever give up. Jesus knows you and He wants you to take all to Him in prayer. I will pray for you. I don't know you sis but am praying for you. Cheryl, I think you prove what many have realized, that too often "religion" is bad. Doesn't matter it's name. Misapplied and perverted by many who are often well-meaning, but have been taught incorrectly themselves. It's a deep pit that the human race has fallen into, mostly by choice somewhere along the way, because God has always allowed enough light into every life, but if too far removed from it, we often turn away in disbelief, thinking it's just not possible. Read Psalm 40:1-3 and realize that no matter our present experience, there is no pit too deep for our Lord to rescue us out of. The future for all who "wait patiently" while crying out to Him, believing in His promises, will be more than we can imagine. For THIS He has preserved you, me, all of us, that we might share in His great joy forever when all sin is removed from existence(Jude 24). For some the night has seemed dark and long as Satan exercises every effort to keep us from the Truth, but the day comes soon and will never fade away. Until we exercise faith in Him, God does not "take us" lest in doing so, He lose us forever, since only while living can we choose. We are each too precious to Him, even though many can't imagine how or why. Jesus on the cross proves it, and we need only to contemplate His life/death to see it clearly. This will change everything for anyone who believes. His wonderful invitation reaches out to every soul: "Come unto Me...and I will give you Rest!" What have we to lose? Amen!! Well said! Thank you for sharing!! Cheryl, God loves you and wants to save you. Don't let Satan steal your joy!! Dear Cheryl, I very much identify with your pain and suffering. Thankyou for sharing here. I'm so sorry about your past. Yet I'm glad that people on this forum understand that Christian people do suffer great insults and injury. I pray that you shall reason with God and hear His own pain around what has been your experience. Perhaps one day you'll be able to offer comforting words,a listening ear and soft heart to someone who had similar situation. May God bless you my beautiful sister. I have been and am where you are. Sadly I know what it's like to pray that same prayer before sleeping. Only to awake and at some point the next day thankful that my prayer went unanswered. Trust that God has already weighed each and every trial and he knows that you can bear it... We have to cling to his promises. Cheryl, I think the only thing that can keep someone who has suffered so much is the thought expressed by Paul (who also had many troubles) that compared to eternity this life is short. 7 But we have this treasure in earthen vessels, that the excellence of the power may be of God and not of us. 8 We are hard-pressed on every side, yet not crushed; we are perplexed, but not in despair; 9 persecuted, but not forsaken; struck down, but not destroyed—10 always carrying about in the body the dying of the Lord Jesus, that the life of Jesus also may be manifested in our body. 11 For we who live are always delivered to death for Jesus’ sake, that the life of Jesus also may be manifested in our mortal flesh. 12 So then death is working in us, but life in you. 13 And since we have the same spirit of faith, according to what is written, “I believed and therefore I spoke,” we also believe and therefore speak, 14 knowing that He who raised up the Lord Jesus will also raise us up with Jesus, and will present us with you. 15 For all things are for your sake, that grace, having spread through the many, may cause thanksgiving to abound to the glory of God. I'm sorry for the pain that you are undergoing. I remember I was angry with God after a loss of a loved one, Satan is a at work to ensure that you don't see the value of our creator. In pain and suffering there is a voice that will be telling you God does not care. Remember He knew you even before you were formed in your mother's womb, He will never give you huddles that you can't manage. Give him a chance. I'm praying for you sister wherever though art. Hymn #281 "I Bore It All For Thee" Is Most Comforting & Assuring. We Really Love You In Jesus Name For Sharing, So That We, The Body Of Believers Can Respond Appropriately In One Accord. eg: ln Any Of Your Excruciating Circumstances, "Did You Ever Sweat Great Drops Of Blood" Then Remember CHERYL, That's LOVE, He Came To Bare It All For You And For Me Too. dear cheryl and all my brothers and sisters, when we ask, "why me?" we should say, "why not me?" remember that God doesn't play favorites. He loves us all the same and causes rain to fall on the just and unjust. how we deal with the bad things that happen to us is a testimony for God. is he this tyrant that satan says he is, or is He merciful and loving? job has given thousands of people hope and inspiration. you can choose to see past your suffering and look forward to heaven. our suffering lasts for but a night, but joy comes in the morning (light). this time is a drop in the bucket, but the time of joy with the Lord will be for eternity. i love you all! Your story has reminded me that there are people around me who need love and that Jesus is depending on me to do my part. After i responded to your cry by writing out a sermonette, I realised that you needed a hug more than words. I pray that some brothers and sisters around you have practically shared Jesus' love with you, restoring your joy and hope in the Lord Jesus. i will keep you in my prayers. •We are His hands to touch the world around us. We are His feet to go where He may lead. We are His eyes to see the need in others. We are His voice to tell of His return. We are His love, burning in the darkness. When God gave man free will because he wanted man to freely love him.. And because of this God has no power over free will, as nor do we, when will pray for another to change... God's favorite and most highest angel fell from grace when he became power hungry and the ego was developed and separated from God's divine plan.. L.. claims to the other celestials of the heavens that they too was as powerful or more that God.. Although L. fell from grace and began building his army.. Still God could not destroy what he created.. And casted out of heaven's .. and vowed to God that he will win, for man will destroy himself and he will be released from the chains that binds him and prove to God .. man can not truly love. It is quite astonishing that the only Son of the Father thought heaven not worth His time if we weren't there with Him to share the joys. Me, a 60 something yo male, tear up every time I consider that.How can we not respond with that same self-sacrificial love? That is why God didn't zap Lucifer. He wanted us to know His love...who He truly was...a God OF love. Satan had suggested to Eve that God was not love...that He was selfish. And man to a great extent has continued believing that lie, they have bought into that idea and thus reject God as a result. If Lucifer/Satan had been zapped however, we would never had known the depth of the love that the Father and His Son have for us. By keeping Lucifer alive and allowing his false lying theories to develop, God has, in the ultimate scheme of things, done us a great favor...even if at infinite cost. i have a thought about why satan was allowed to go through his downfall and convince and deceive many. if all have free will, then we are all subject to falling. if, however, we are given a choice, while seeing sin unfold in this world, then all people and angels would make their eternal choice. all people and angels that choose God over satan will forever remain loyal to God. no longer will sin be able to enter, because every heart was tested already. then sin will be destroyed once and for all! all of the universe will see that God is all loving, merciful, etc. God will be vindicated and doubt will never come again! hallelujah! Yes, ye who has never sinned, let him cast the first stone.. There is no such man but Christ who died for our sins .. man kind would have terminated and Satin released and all would return to darkness and without void .. Vengeance is mine saith the lord and we are to be judged by our word and our deeds.. The tongue can be a very sharp cord and judgement is not ours to make. We are to follow our hearts .. for all know deep within what is positive and negative . if we are a positive force in life . we build life.. if not we pray and consume all that we can and destroying the innocence of a child has got to be one of the worst actions against life .. But it does not shame or bruise the child. Alter egos are coming for those who have trauma .. it is a way a person lives with the guilt or memory .. a survival thing and nothing should make a person feel more rejoice because you are a survivor .. many don't .. I too have this life behind me.. and my story only embarrasses those who are not true to their own face .. especially others.. And victims many times become perpetrators. The devil want's no one who wears a robe of white satin.. (prepare with purity.. Remember Satin bets there is no such thing as true pure love. But christians .. it will only take one believer .. that will call upon God that in one hour will change this world's direction from destruction.... God needs our love .. this is not about us! As humans, we tend to think that having all power and knowledge is the solution to every problem in the universe. Obviously, that's not true because God would have definitely chosen another way other than CALVARY. In the final analysis, God is the ONLY ONE who loses His creatures. Created beings do not deserve life. If they chose to rebel against God they go back to the place from which they came NOTHING. Yes, Jesus would bear the scars of His crucifixion and humanity forever. If there was a better way, God would have chosen it rather than making the GREATEST SACRIFICE the universe ever witnessed. So if anyone lost in the whole process of creation it was GOD. the world is not earth..the world is the people.. the earth and animals didn't need us and still don't to survive... .. earth and animals will live on if man destroys himself... .. but man can't live without earth and those who have desperately worked hard to destroy it, think they will live in space.. so smart but so dumb and forgets what happens, when you take an electron from a single cell atom. That's is so true, thank you for your insight. I will pass this on. Dear Sis Cheryl I am a 63 yr old survivor and feel your pain. You have been to hell and back and you wonder why? Because of sin not because of anything you did as a child to deserve such abuse but you have survived. God kept you throughout it all - he kept you from becoming crazy with all that stress and he kept you from being killed though Satan tried. You are alive and able to write because God loves you. I still struggle with seeing God as loving because of my own pain but without that belief we have no hope for the future and I cling to that hope because I won't believe that all God has for me is suffering. I have had some good things in my life that I am very grateful for amidst the suffering. Please don't give up - you've made it this far and God will reveal his love for you. Jeremiah 29:11 promises that. I have spent most of my life angry with God for much that has happened but I realize that without him I have nothing to hope for and he has finally shown me how he has kept me throughout the madness and chaos in my life. I will be praying for you - please hold on to the Lord. God created every creature with the potential to grow into a glorious existence of sharing the great joy that God finds in each of us, which He is desperate to share with all who will accept it. This can only happen if it is our choice. God would know the difference between choosing not to sin or being unable to sin, and it would rob both of the true delight that only genuine love can bring. Doesn't everyone understand this as well? We have the capacity for it and I believe we can each understand where God is coming from. Yes, there is great risk in this idea of being free to chose, but the rewards exceed the risks, and in the end all will understand it perfectly(though for many, too late). Whether Lucifer or another, the chance of the inevitable was always there, and only by meeting it with Truth can it be forever remedied. Every discordant soul chooses to be so, and yet God offers complete pardon and restoration for all who will turn from the futile rebellion that only hurts the rebel, though it hurts more deeply the One rebelled against. He knows too much and our misery robs Him of perfect peace and joy. He is too acquainted with our sorrow and it wounds Him to know it. Yet He gave each of us the opportunity, regardless of the pain in brings Him that cannot be measured by us. Lucifer had every advantage, but made choices, being free to do so. Out of tender regard for all of His creatures, God has allowed these choices to bear their full fruit so all would see "why" He has a law. Not really a "law", except to those who violate it. But if we see it correctly, it is EXACTLY how we would want to be treated by everyone else. Freedom of choice/ free will? why still go ahead and knowing create something that will cause all these suffering and death?unless it is survival of the fittest in the end.We need a better answer. Collin, it is not survival of the fittest, yet all are given freedom to choose their final outcome. The Bible tells us in the end truth and justice will prevail and all who choose to follow this way will enjoy eternal peace and endless joy when the earth is restored to it's former perfection. The challenge came and had to be met properly in order to allow all to see the Truth versus the falsehood. The Bible brings perfect clarity to this question and gives sound answers. For instance, read Psalm 73. Collin, it was the Creator Himself who suffered and still suffers most because of sin. But He created angels and humanity with free will because He wanted a love relationship with us, and love is not possible without free will. Please ask God to give you understanding of the character of God that is beyond our comprehension. The truth will stand forever!! Love without a choice is not possible. Thankx mum inge for bringing up a wonderful thoughtful lesson,may God infinitely bless you and everyone who read this topic. Those "born or begotten of God" ALWAYS CHOOSE to serve GOD. They have the "genes" or "seed" of the FATHER. "You must be born(begotten) from above." John 3:3. Can i ask a childish question please; what does the devil look like? Does he still have the otoginal beauty that God created him with? Satan/Lucifer has chosen to remain hidden from view, working through others to obtain his desire. He will be revealed according to prophecy after the 1000 years of Revelation 20. (See Isaiah 14:16, Rev 17:8,11) Notice that in Revelation 17, the scarlet beast (satan) is described as "was, is not, and shall...". He is currently in the "is not" phase of his existence, choosing to work under the cover of darkness through willing human agents. But he will be seen at last as Isaiah 14 describes, along with Revelation 17 when he ascends from the bottomless pit after the 1000 years. At this time. all will see both Christ glorified and Satan as the fallen cherub that once stood at the side of God in his innocent glory. "How art thou fallen?!" will be the wonder of all when both the redeemed and the rebellious from every age all meet for the first and last time, the rebellious outside the city looking in, and realizing their loss due to the deceptions of "the man" they allowed to deceive them and rob them of their crown of Life(Rev 3:11). While some have been shown views of Lucifer in visions/dreams, we do not have any clear representations of his face or form, only that He is a fallen angel who has become horribly evil in his intentions against his Creator for reasons only he could know. Pride, jealousy, coveting, and all that those cherished feelings will bring will change us for the worse. The Bible tells us that Satan has the ability to appear as an angel of light. (2 Cor 11:14) That's how he appeared to Christ in the desert. I believe that beyond that, it's useless for us to speculate. That's a very painful what has happened to you. Please allow God to help you to forgive your parents and each and every person who has hurt you in your childhood. Forgiveness is the first step to healing, it will help you to release all the anger you are feeling. We will keep you in our prayers. That you can still share your experience (especially with us here on this forum) is a clear indication of God's love and your perseverance. God has used you to encourage some of us just like He used Job. Yours is a very tough experience which i don't think some of us would have lived through even for a day without giving up on God. when we read stories of what people like job went through in the Bible we just take it as just a story but your experience is God's way of showing us that it is real and that God still keeps His own when they go through tough times and i see the reality of James 1:2-4. I would want to encourage you to be strong in the lord for Satan's hatred and darts are greatly manifested and directed at those God loves the most. sometimes when everything is smooth for me for a long time i start wondering if God still loves me because i pray the most when i go through the most pain. And each time i pray, i get more strength to face even more. I am very sure each time you went through the pain that you experienced you were drawn to your knees to ask God why which is what prayer is (reasoning with God). Pain sometimes is the fastest vehicle to heaven because without it, we only see heaven being many years away but with pain, our heaven is as close as tomorrow or the next minute when God takes away our pain even if it is just for a short while. I cant say i understand what you've gone through neither can i have enough authority to empathize and say sorry but what i can do is think about you when i am going through pain and say if God gave Cheryl the strength and stood by her side all through, then He can also see me through this little challenge. If i could contact you i would every time i was going through tough times so that you could encourage me because you have experience. And your story should be told and retold to encourage even more people about the price one should prepare to pay when we choose to follow Jesus just as long as God has warned the devil "...behold all that he has is in thy power; only upon himself put not forth thine hand..." Job 1:12. Do not pass me by." There is one thing that should never be mere hearsay is the presence of Jesus in our hearts, and the story of what He has done for us. This is a testimony you must tell others. Cheryl, the brothers and sisters who have written their comment regarding what you are going through. Your problem has become a shared problem, we are involved with you in this warfare. There is a promise from God, I would encourage you to take it personally: PS.34:8 "I will instruct you and teach you in the way you should go; I will guide you with My eye." And Ps. 139:23-24. I would like you to take comfort knowing that Satan is a defeated foe. You have victory in Jesus name. Amen. Mr Croft (above) has a great request: "why still go ahead and knowing create something that will cause all these suffering and death? ... We need a better answer." Your reply really misses it. God can't not create someone because it somehow will violate their free will to do evil later? That makes no sense at all. You make God a prisoner of his own foreknowledge, and He is left with the blame for bringing evil into existence. I suggest a much, much simpler idea: God did NOT know that Lucifer would rebel, nor did he know that about the angels or about Adam or Eve. They all were created perfect, with no seed of evil within them, and it really was of their own, genuine, free will that they sinned. God did not know it would happen, but he knew that it was a possibility and he had a plan prepared in case it did happen. Do not dismiss the idea so quickly just because it seems new or shocking. Upon reflection and searching your Bible for what it says and does not say, you will find that it makes a lot of sense and releases God from any blame for creating evil. It seems to me that your "solution" to absolve God of blame is not needed, because God did, indeed, create the angels pure and perfect as well as creating Adam and Even pure and perfect. "Foreseeing" is not the same as making something happen. The angels were, indeed, truly free to choose. So were Adam and Eve. The teaching that God does not know the future distinctly creates a lot more problems than it solves, and, in this case, I'd rather take the word of Ellen White for the history of sin than your word or the word of other adherents of "open theism." Note that God and Christ "knew of the apostasy of Satan, and of the fall of man." Knowing, however, is totally distinct from causing something to happen. You may be watching TV and see something happening on the other side of the world in real time, but that doesn't mean that you are causing the action. In like manner, God can see the future, but that doesn't mean that He violates free will and causes the choices He sees that individuals will make. The best answer as to why God created beings who He knew would cause Him untold suffering is that God wants a relationship with His creatures, and that makes free will necessary. And free will necessarily means the freedom to choose to step outside of God's will. Dennis I agree that Mr Crofts question does deserve as adequate an answer as humanly possible to give. First consideration is God's for/knowledge. What all does that include? Second consideration is, what was the controversy between God and Lucifer? Regarding the first consideration, The text in Genesis 22:12 "now I know", plus any number of texts that say God repented of a decision, would indicate that circumstances unforeseen, had caused His change in plans. Genesis 6:6,7,12,13. Plus the second consideration we refer to,are the texts in Ezekiel and Isaiah that describe the reason for Lucifer' downfall. However the reason for creation could be over the controversy whether God could create a sinless being that would love him unconditionally of his own fee will. Jesus proved that He could. It doesn't diminish Gods Omnipotence or Omniscience. Or any other Godly attribute. I totally agree with you that God sometimes changes His plans based on circumstances and events in our lives. Why else do we even think to pray for a friend to be healed, for example, if not to change what God might otherwise allow to occur? I've read different speculations about the reasons for why God created the earth and human beings. (Yes, the original topic was the creation of Lucifer.) One account describes it as a new thing that God was doing, in contrast to the creation of spirit beings such as angels, and that it prompted envy and discontent in Lucifer who was not part of the planning. Another is that we are simply one of many created, physical worlds and just happened to be the one that yielded to the devil's temptation. And another is that we were created as a test case as a result of the controversy and rebellion, to show, as you state, whether or not God could have creatures who freely loved and obeyed Him. I don't know if Ellen White has told us which idea is the correct one. During the 10 days of prayer, we are still praying for you. That Jesus may be victorious in your life. That your health may be restored and your hope be revived. That God may restore the years that were eaten away by locusts, so that you may find joy in life, even at your age. The devil's mission is to steal, kill and destroy. Jesus' mission is to give life in abundance. John 10:10. Please receive abundant life in Jesus' name. It is true that life on earth can sometimes be difficult, but Jesus said it himself in John 16:33. 'In this world you will have many troubles; but be of good cheer, I have overcome the world'. Thank you Jesus for winning this battle on our behalf. Hello Inge, and thank you for your reply and the opportunity to share a little more. ""Foreseeing" is not the same as making something happen." Perhaps, but making something happen is not the subject. Foreseeing my action does mean I am not truly free in what I will decide to do. It's interesting that God allegedly knows in advance that Lucifer will turn into Satan, but He does not know whether Abraham will obey Him until Abraham actually does it (Gen 22:12). I don't think you've explored all the difficulties the conventional idea presents. Granted there are difficulties with Open Theism, but they are fewer and less profound than those in the traditional interpretation. Mrs White wrote that God knew of the apostasy of Satan, and of Adam's fall, in advance. She also made incorrect statements about the number of planets in the solar system, that eating pork was acceptable, and that God did not love children who misbehaved. I don't think those other statements are a problem, and neither is the one about Lucifer. She wrote in the context of her knowledge at that time, and some of her statements are corrected later in her life, but there's a reason why the Bible is our standard for doctrine and not Mrs White. God created beings whom He knew *could* someday cause Him, and themselves, untold suffering, because He wanted other intelligent beings who could share a loving relationship with Him. That made free will necessary. It also meant accepting the *risk* of sin and rebellion, but having a world of others with whom to share His love was worth that risk. Mrs White says a lot about the risk God took. What, exactly, is risk? Dennis, don't forget that God is obviously (as witnessed by prophecy) not bound by time as we are. We can't understand or explain it, but we can see the evidence that is it true. But even in our limitations, if we know someone well enough, we can accurately gauge their response to specific circumstances, and if correct in our assumption, do we influence them? Don't they only reveal our knowledge as accurate, though our knowledge does not remove their choice? Sometimes people surprise us don't they? Is God ever surprised? How can you say God did not know of Abraham's choice, even before Abraham made it? He knows each of us before we were born (see Psalm 139, Isa 44,45 concerning Cyrus, the prophecy to Jeroboam through the man of God, etc) as prophecy indicates. The men who gambled for Jesus' garment were not following a script or being coerced, yet it was foretold. If God manipulated even one event, don't you suppose Satan would jump at the opportunity to point this out? What is the risk? Are you referring to God going forward with His intentions though great tragedy would follow if He didn't "force" everyone to behave? You don't see the risk? Do you understand fully the remedy required? Do you understand (as you seem to have explained above) that those who write about these things from their human understanding might use language that is limited? On Ellen's inaccuracy concerning the number of planets, what if God had shown her the correct number, how many in her day would have listened? What if the number she gave exceeded the number we know of today, how many would have confidence before it was confirmed by men? God reaches us where we are. I wrote earlier that "'Foreseeing' s not the same as making something happen." I did not explicitly state so, but it should be evident that if it is not the same as making something happen, it leaves individuals free to choose. I believe that free will vs foreseeing is a false dilemma. But you write that "Foreseeing my action does mean I am not truly free in what I will decide to do." Thus you appear to assume that God seeing your choice ahead of time is equivalent to His choosing for you or making it happen. I still believe that a good modern analogy is seeing something happen on the other side of the world through the technology of TV. We can *see* the action without influencing it. In the same manner, God can see our choices ahead of time without influencing them because He is not constrained by the time-space continuum but exists outside our dimensions of time and space. Whatever choice we make is the one He sees. It has absolutely no effect on our freedom to choose. The arguments on both sides of the question have been presented many times. Please refrain from using our comment section to promote the open theism view. What C.S. Lewis wrote was true until recently, "Everyone who believes in God at all believes that He knows what you and I are going to do tomorrow” (C. S. Lewis, Mere Christianity [New York: Collier Books, 1952], p. 148). And I believe there are good reasons for this almost universal agreement among Christians. If God cannot know the future with certainty and He is sometimes taken by surprise, how can we be sure that the future will play out as He has told us it will? How can we be certain that Christ will indeed come back as He has promised and foretold? It seems to me that if we worship an uncertain God, we, too, face an uncertain future. A God who is learning new certainties every hour, and who has to adjust His plans continually to deal with these new certainties, is a different kind of God than one who knows everything that ever was, everything that now is, and everything that is to be. Its a hard road to travel, signs and wonders tells me we don't have long way left to go. Brothers and sisters our faith in God's promises tested every day, when peer pressure hit in all different ways we just need to lift up our eyes to God, shout Jesus we know the enemy will flee. lets not give up but press on to seize the prize. We will stumble and fall at times, but lets not stay down, God would have given Lucifer the same chances he is giving us today if he did just humble himself. Everything that happy to us today, lets look back at Job he never give up, he said the Lord give the Lord take. Our Lord God and saviour promise not to give us more than we can bear, so lets trust and believe His words. Psalms 120:1 In my distress I cried unto the Lord, and He heard me, and last but not least remember Psalms 23 it is powerful enough to let the enemy flee. God bless you all AMEN AND AMEN. Inge - Many thanks for this excellent, thought provoking article. Personally, I believe that you have some very profound truth in your additional comments, but I also understand the points that Dennis is making around his comment "God did not know it would happen, but he knew that it was a possibility and he had a plan prepared in case it did happen." I would like to suggest that theologically I am midway between the two of you. Robert, I also agree with you that "He knows each of us before we were born" as taken from the Bible verses quoted and in describing the prophesied scene of casting lots at the foot of the cross for Jesus' garment. Did God forsee that it could and would happen? - yes. Is that predestination? - no. Did God know what would happen so that he sees the end from the beginning? - yes. Did God know how it would happen and the individual decisions that every created being would make - good angels, other created worlds, fallen angels, fallen humanity? - no - absolutely not. This was granted as free choice and free will for all intellectual and intelligent beings to arrive to their own decisions and conclusions about Him and His character. This is why Daniel has seen the books 'being opened'. Why every deed is being recorded and why there needs to be judgment. God has invited judgment to begin at his own very throne, with His own government and with is own character. Can any created Being ever deny that God has not been just and merciful by granting the provision of His own dear Son and to allow Him to die on the cross of Calvary for the forgiveness of humanity's sin? Didn't the events at the cross have a much deeper significance for the balance and ultimate security of the Universe as well as providing salvation for Mankind? Could the 'sanctuary have been cleansed'? Did Jesus Himself consider it predestination when He was 'cut-off' in the midst of the 70th week? The seed of rebellion started in Lucifer because of pride and selfishness. He was not privy to Inner Counsel of the Godhead and looked to steal the adoration from the angels away from Christ, their true leader and Creator. God did not create this seed of rebellion, neither did Christ stimulate it. It was borne out of jealousy, murmuring, hatred and ambition. God is a God of order, balance, logic and reason and all attributes are based on the simple premise that He is Love ! He doesn't play with chaos, animosity or strife. He doesn't force, coerce or play in the realms of deception. These are the tools of the enemy! So why isn't God interested in understanding if I am going to touch my ear or take a left turn or to choose to eat a pear instead of a banana? Why? - because it is of no significant importance or of any salvation benefit to me. Is He concerned if I were only ever to eat processed fast-food and no fresh produce? Of course - but the consequences would only be mine to bear! He also has guardian angels to watch over us so that in our humanity, should we have that relationship with Him and requested His Divine protection, He is able to provide this for us. Should provision not be granted, it is not because He doesn't care or love us - it is because we have an adversary constantly wanting to take us down and the bigger picture may serve as a witness to save others and bring others to know Jesus Christ. I personally would be happy to lose my life in this world only if I am safe in the knowledge of salvation and eternal life in the next. Consider Jonah. Very often this book is misinterpreted by only examining the prophet himself and his character. More recently I have been dwelling on the book from the perspectives of the questions raised in your original article. God asked His prophet Jonah, to go and preach in Ninevah and warn them of pending doom. Understanding local culture in Ninevah, Jonah chose to venture in the opposite direction. Knowing the end of the story regarding the Ninevites, God had a greater plan than Jonah could understand when he was first asked to go. God knew that the hearts of the people would hear His Word! What is interesting then is that when Jonah is on the boat, with every foot and yard that he travelled away from Ninevah, the storm grew worse and worse. The devil could smell success with the drowning of Jonah to the point where he begged to be thrown overboard to save the merchants and their vessel. God then delivers a great fish to save Jonah and put His mission back on track. The devil is chastised for trying to kill the prophet. The merchants are converted, the Ninevites repent and are saved from their doom, yet Jonah still doesn't understand the bigger picture and decides to have a moan about his failed prophecy and then question God's mercy on the city! Ellen White - 'Like Israel, Christians too often yield to the influence of the world, and conform to it’s principals and customs,in order to secure the friendship of the ungodly; but in the end it will be found that these professed friends are the most dangerous of foes. The Bible plainly teaches that there can be no harmony between the people of God and the world. Marvel not, my brethren, if the world hate you.” Our Saviour says, “Ye know that it hated me before it hated you.” John 15:18 . Satan works through the ungodly, under cover of a pretended friendship, to allure God’s people into sin, that he may separate them from Him; and when their defence is removed, then he will lead his agents to turn against them, and seek to accomplish their destruction.' (PP – p559). Whose side are we going to choose? Will we choose the apostate rule under the dominion of sin and the control of satan, where the only certainty is death? Or will we stand up for God in the name of Jesus; be counted and truly mentally and physically vindicate His character from how satan wants Him to appear in this time of universal history? We will then be able to live comfortably in all eternity knowing that His Holy and Divine character is our only source of life. This is truly our free will to choose and praise be to a God that allowed that to happen. I really want to continue knowing Him and one day discuss this topic with Him. Mark, it doesn't strengthen your argument when you contradict yourself. Either God can exist in the future or He can't. Nothing is secret to Him or to whomever He chooses to reveal it. Take for instance when the Holy Spirit of God through Jesus told those two disciples to go fetch the foal that He would ride to Jerusalem, or the fish Peter was to find a coin in the mouth of. God has seen what we call the future into eternity, but that means something different for Him that for us, or He would allow us the same ability. No, I can't understand it, but I can understand the facts revealed in the Word of God which helps us to have faith. He knows the path I am on and where it leads, just as with Joseph who went from pit to palace through circumstances that helped him (and we who study these stories) to have absolute faith in God's ability to lead safely anywhere. God laid out through Daniel the order of the world kingdoms, some which were not even in existence in Daniel's day. The events have taken place exactly as shown in enough detail for us to realize, God has been there already. How infinite is He? We cannot fathom it. But we can rejoice in the infinite power, wisdom and knowledge of our Father in heaven who gave us His only begotten Son. He is one of us, and has shown us how we can be One with Him and our Father. Robert, I think you're making Jesus' statements entirely too mystical. > to Jerusalem, or the fish Peter was to find a coin in the mouth of." It's entirely possible, and I think probable, that Jesus had already made arrangements with the owner of the foal and simply told His disciples where to find it. And Jesus could tell Peter that he would find a coin in the fish because God enabled that fish to find a coin and seek out Peter's hook. Those things, like many others, may appear to you as the predictions of foreknowledge when instead they are the statements of God's will to make them happen. I read a lot of mystical statements asserting that God exists "above time" or beyond it or etc. The Bible simply describes Him as existing "from everlasting to everlasting". There's no need to interpret that any further than saying God has always existed and always will. Dennis, isn't there just too much evidence in prophecy to realize that God has already "been there"? How else do you account for the wonderful accuracy of prophecy? God has spoken though many, such as Daniel, Isaiah, Jeremiah, etc, and as easily spoke through Christ. With whom did Jesus make arrangements concerning the denial of Peter and the rooster crowing? Did He also arrange the betrayal by Judas? You're trying to make things too simple, Robert. If Jesus made arrangements for His triumphal entry into Jerusalem, that does not mean He also arranged for Peter to deny Him or Judas to betray Him. I don't see how I have contradicted myself if you read what I have said in context. Some of the comments that you make in your reply to both myself and Dennis have the distinct sound of predestination and this element turns humanity into robots or actors performing written lines in a play. No choices - just a duty to complete the job at hand and ensure that God's Will is completed as He has said. Take away free choice, free will and the ability to communicate and reason with God and you arrive at the character of an arbitrary God that won't tolerate any nonsense from His created Beings even for a nanosecond - Splat! - Discourse ended and subject removed. But the Bible doesn't teach this about God. We have examples of dialogue all the way through scripture - not all with positive results (free choice / free will). Adam and Eve, Cain, Noah, Lot, his wife and family, Job, David, Hezekiah, Jeremiah, Jonah etc etc. The difference that I am proposing is that God DOES know the end from the beginning. He does know us individually and He does know the numbers of hairs on our heads. But whilst He knows the end from the beginning and He knows the key events that mold Earth's History, He is still appealing to every single human being to respond to His calling. This calling evokes a response either to accept the free gift of salvation or to reject it. This is our ultimate choice for eternal Life or eternal exclusion from the presence of God. We all have been bought with a Price at Calvary, but that is our own individual responsibility and choosing, not preordained or decided by God. It is your own choice or my own choice. No-one else is to blame except the devil who stands between us and God as our accuser whist trying to persuade us to wallow in our sin or be overtaken by the sense of worthlessness! "Behold I stand at the door and knock" is not the voice coercion or the action of force. The Holy Spirit needs to be invited in before God can start the miracle of transformation into likeness of His character. Until then we live by Grace and in ourselves, but not in Christ or Christ in us! "Then Satan entered Judas, called Iscariot, one of the Twelve." Luke 22:3. This is force, coercion and temptation. This language is used to differentiate between how God and Satan work. Mix these up and we arrive at disaster in how we comprehend God. Is God interested in which way you drive to arrive at a destination, fastest way or scenic route? Not really, unless His Divine protection was being called to keep you safe along the way so that He can speak to you to divert your route avoid a nasty collision. Is He interested in whether you eat breakfast before taking a shower in the mornings? No not really because these types of decisions are not life-changing or life threatening - they are your individual choice and preference. Does He know if you will do one or the other ? - no it is up to you. But if He asks you to change your route because He sees the accident up ahead (as the bigger picture in His worldview) or to take a shower as He sees that a friend in need is on the way to your house and time is of the essence (in His bigger picture worldview) - our responsibility is to hear His voice / prompting and obey - or face the consequences. What we tend to do also affects other people through spoken word and action, so the Great Controversy, with its accusation of humanity and blood of Jesus' saving Grace behind the scenes, rumbles on until the date and time that God says enough and sends Jesus to draw an end to sin - and ultimately time as we currently know it! Let us pray that each one reading this topic of discussion is there to ask God this question on His knowledge, interaction and dealings with humanity and how He does it! Mark, your 2nd and 3rd observations are contradictory. God doesn't manipulate anyone, but has seen the end from the beginning. There is no detail He hasn't seen, but He lets it play out as it will, while giving every opportunity for sinners to repent and learn to trust in Him. Once sin has been seen for what it really is and its inevitable conclusion, it will be possible to deal with any possible rebellion without allowing it to spread further. One who afflicts, as Satan has, will never be seen again. That's how I understand the promise of Nahum 1:9, because free choice will never be removed. Back to your 3rd observation, Jesus knew how many times Peter would deny Him before the roster crowed twice. How exact does He need to foretell before we understand what God knows already. I sound nothing like predestination because I don't accept it. I do understand (in a very finite way) what God has revealed about His ability to have seen the future already. I don't know how, but the evidence is He's seen it. If not, He has manipulated men. There are only two options for what God has shown us. Hi Robert, Thanks for responding. I need to clarify my earlier comments, because you're responding to questions I did not mean to raise. I don't have a problem with prophecy, but we obviously understand it differently. >> "How can you say God did not know of Abraham's choice ..."
I can say it, because that's the meaning of Genesis 22:12 that I cited. Only after Abraham had committed himself to the act of obeying God's severe command did God say "now I know" that Abraham feared Him. The plain meaning of that text is that God did NOT know before. God's prophecies about Cyrus are not a problem, but I'd rather avoid getting sidetracked right now. >> "What is the risk? " Sorry -- perhaps I was too subtle. I understand the risk, largely as you described it. But I asked, "What is risk?" i.e., What does it mean to take a risk. What does "risk" actually mean? Can it truthfully be said that you took a risk, if you knew the outcome in advance? Yet Mrs White writes much about the "risk" God took in creating the universe and especially in sending Jesus to be our Savior. Words mean things. Last, about Mrs White's erroneous comments -- we don't need to deal in "what-ifs". The point was that some things she said we now know were incorrect. Some of those she corrected herself later in life. She presented the great controversy and God's plan of salvation in the context of contemporary knowledge and understanding. I think that's similar to what you wrote as God reaching us where we are. I believe her comments about God knowing of Satan's apostasy from the beginning are of a similar nature. But our standard of belief is what the Bible says. God can and does manipulate events when He chooses. He does not force our response to events, and that is where our free will is manifest. God did not create evil, nor did He create beings that already had the germ of evil within them. Evil has no justification or explanation. It is the independent *creation* of free-willed beings who chose to rebel against God. I hope that is helpful to get us talking about the same things. Have a good day, and may God bless all who read here. What God was saying to Abraham was "now you have shown". God foresaw the very hour of Jesus' death at the hands of wicked men, and revealed it in the hour of sacrifice for the Passover service centuries before. He saw the manner of death along with all the related details of the betrayal, time in the tomb, etc. God simply allowed Abraham to show his faith by his works of obedience to God's commandment, and in the process Abraham was shown the role of the Messiah to come and "rejoiced". He learned this from the propitiating ram caught in the thicket, which God provided. God could tell you every thought you will think and every word you will say from now until eternity. Yet, having that ability doesn't mean He always exercises it. But I could be wrong on that last thought. If God is the God of the Bible, He is omniscient, omnipotent and all the other “omni”s. God *boasts* of His singular deity throughout Isa 40s. Remember Abraham had something like a 3 day trial or struggle taking his *only son* to sacrifice. This was a test of Abraham’s absolute trust in and loyalty to God. This was Abraham demonstrating God’s role. The sacrifice was virtually offered. God stopped it at the last act. The purpose to do it was shown in all human sincerity and completeness. Heb 11:17 and James 2:21 speak of it as actually made, and by that work he was justified. God, the Omniscient, declared His acceptance in language that describes the highest terms of approval. God had actually experienced Adam’s FEAR of Him. God *knew* this beforehand though. He is God. You suggest that "Love" doesn't exist in forced obedience because God has instituted "free will." But I believe that we can and must qualify and quantify that idea. Empirical evidence substantiates that when men and women make their choices apart from God's will, we engage in abject behavior. It is so prevalent in the human race today. It started with the first disobedience in Heaven and continues to this very moment. There are ways of God so beyond me. How can I understand or even question Him when I study the Bible and it reveals to me actions that I cannot receive an immediate or reasonable answer? As far as God's relationship with humanity, from what I am studying from the Bible, the prevailing thought is Love and Obedience. If God had instituted "Free Will Carte Blanche", why should God get involved at all? All choices that men and women make are not just loving and spiritual, but some choices are horrific physically. Why don't God just let men and women do as they please without any restraints? Let's not hold them accountable. What happens if God doesn't get involved? What would happen if God does get involved? Love and mercy demands that actions against "free will" are in accordance with what the bible teaches. children often. Need I say anymore? 15 Don’t you realize that your bodies are parts of Christ’s body? Should I take the parts of Christ’s body and make them parts of a prostitute’s body? That’s unthinkable! 16 Don’t you realize that the person who unites himself with a prostitute becomes one body with her? God says, “The two will be one.” 17 However, the person who unites himself with the Lord becomes one spirit with him. 18 Stay away from sexual sins. Other sins that people commit don’t affect their bodies the same way sexual sins do. People who sin sexually sin against their own bodies. 19 Don’t you know that your body is a temple that belongs to the Holy Spirit? The Holy Spirit, whom you received from God, lives in you. You don’t belong to yourselves. 20 You were bought for a price. So bring glory to God in the way you use your body. First, we know that the Bible never mentions man's "free will." In fact the words never appear in Scripture, because the Bible teaches the opposite. When we are born, are we in a neutral zone where we can choose right or wrong? Psalm 51:5 I was born to do wrong, a sinner before I left my mother’s womb. The Bible teaches that men are born "slaves" to sin. Rom 6:17 In the past you were slaves to sin—sin controlled you. But thank God, you fully obeyed what you were taught. 18 You were made free from sin, and now you are slaves to what is right. Are we incapable of moving beyond our sinful nature on our own. The Bible says that through faith God delivered us from sin and into a relationship with Christ, which Paul describes as slavery to Christ. Ephesians 6:6 You must do this not just to please your masters while they are watching, but all the time. Since you are really slaves of Christ, you must do with all your heart what God wants. In other words, we have a will to make our own choices, but that will is not free in the full sense of that word. Our nature determines the choices we make, and we are only free to make choices consistent with our nature. As an unbeliever, we were slaves to a sin nature and we were unable to do or say or think anything that might please God. So we didn't have the will to live without sin, so in that sense we were not truly free. All unbelievers are without free will in the sense that they are all slaves to their sin. After being brought to faith by the Spirit, we were given a new nature that says we are no longer slaves to sin. Gal 4:7 Now you are not slaves like before. You are God’s children, and you will receive everything he promised his children., but now we are slaves to Christ. Rom 6:18 You were made free from sin, and now you are slaves to what is right. Again, we have a degree of freedom to choose disobedience or obedience, but we are still Christ's regardless of our decisions, and as such God can use us however the Spirit desires. Job 14:1-5 We are all human beings. Our life is short and full of trouble.2 Our life is like a flower that grows quickly and then dies away. Our life is like a shadow that is here for a short time and then is gone. 3 God, do you need to keep an eye on something so small? Why bother to bring charges against me? 4 “No one can make something clean from something so dirty. 5 The length of our life has been decided. You alone know how long that is. You have set the limits for us and nothing can change them. James, I don't understand what you're actually saying about free will and how it relates to God's will and our salvation. You seem to be awfully close to the Calvinist position that none of us are free to choose the good unless God first chooses to make it possible for us. I can see that to a point, i.e., that without the "enmity" that God put within us to keep us from being totally under the devil's control, we would be unable make our own choice. But that is given to all people, so by God's grace we are all able to make a free choice for good or evil. Is that what you're saying, or is it something else? Dennis, seems you're well read in Calvin! If Calvin holds that "none of us are free to choose the good unless God first chooses...", he is correct. Your statement that the "enmity" is given to all people is totally false. What is NATURAL to ALL is ENMITY AGAINST GOD. Rom 8:3-9 "...the carnal mind (natural man) is enmity against God... They that are in the flesh cannot please God..."
We, Adventists, apparently don't believe this; but God says it. Look how quickly after their sin did God become the "enemy" to Adam and Eve. They communed with Satan, but hid away from God when they heard Him in the garden. Flesh and blood cannot enter the kingdom of God. Man needs a transformation into a new creature. Every single aspect and entity of salvation is a gift of God's grace. Jesus says that "an hour is coming and now is, when the dead will hear the voice of the Son of God, and those who hear will live". He is talking about us, dead in trespasses and sins. How did dead Lazarus hear Jesus' call. I will not even complete this; because it does not matter to people who have their own gospel. I had hoped that I'd just misunderstood your comments, but thanks for clarifying. and between your seed and her Seed" (Gen 3:15). This God did in the very beginning, to prevent Adam and Eve, and their descendants, from being totally under the control of the devil. Therefore, even though we are fallen, God at least has preserved for us our own free will so we can hear His word and respond for salvation. This does not conflict with verse you cited, that our carnal or natural mind is enmity with God. In our natural condition we are unable to please God at all. No Adventist would disagree with that. We are all fallen creatures, doomed to destruction eventually if we continue to reject God's call for salvation. But until He gives up on us and ceases His invitation, we *all* are invited and enabled to respond and be saved. Calvinists do not believe that God wants and calls everyone to be saved. They think that God Himself has actually predetermined whom He will save and whom He will destroy, and somehow that glorifies His character. I think that is a horrible, malicious, evil picture of God, and I hope your ideas do not go that far. > "I will not even complete this; because it does not matter to people who have their own gospel." I reject your dismissal of people who disagree as having their own gospel and therefore not worth your fuller explanation. God will not arbitrarily put this enmity since it would remove choice and would make Satan's claim no longer false. The invitation is "Come unto me...and I will give you rest", because those who worship the beast (the organized power that symbolizes the worship of self) "have no rest...". Much of the problem we have with God's foreknowledge is based on our views of extent. We think that if our knowledge filled a bucket then God has a bigger bucket and our bucket would disappear inside God's bucket. it is not a question of how much God knows, but what God knows. Here we run into a serious problem because we simply do not have the language to describe that and have to resort to metaphor and other figures of speech to express ourselves. I will use an example. Suppose I was a worm living in mud at the bottom of the pond. All I see every day is mud and other worms and occasionally predators with sharp teeth that catch and kill my fellow worms. Suppose that my mundane boring existence was shattered briefly where I was taken out of that environment and shown an automobile. When I am returned to the mud, I find that I cannot explain what I have seen to my fellow worms simply because I have no language to describe it. When it comes to talking about God's knowledge, I simply state that God knows everything that is knowable. Many of the things that he knows are not explainable because we do not have the language to describe it as it is foreign to our experience (like the worm and the automobile). Interesting illustration Maurice. The wonderful thing about God is that He shows us only what is relevant for our need and gives us the ability to share it with those who's need it will fill if they accept by faith. God will never show us all He knows, since it would overwhelm us and give us a burden we are simply inadequate to bear. He hides us from the knowledge that could often bring terrible discouragement or worse. His goal is always to uplift and save, and He is merciful and gracious toward our frailty. Thank you for a wonderful article, sister Anderson. However, you state one thing I have always had difficulty accepting, and that is the point that "Christ risked heaven itself, because He could have failed." After all, since God knows all things, Jesus knew that He would succeed in the earthly part of His ministry "before the foundation of the world," i.e., long before His incarnation. Thanks, Bob. The interplay of foreknowledge and free will is always difficult, as some other comments on this blog demonstrate. Add to that they mystery of the incarnation, and we have something that is far beyond our understanding, and we shall surely go astray when we try to explain it. . I'm happy to accept the possibility of Christ's failure on faith. As a Christian colleague in a Christian school observed, Christ's sacrifice would not mean so much if He had been assured of success from the get-go. And think of this: If Christ could not fail, could He be genuinely tempted in all points just as we are? Remember that Christ laid aside some characteristics of divinity when He took on humanity. On the cross, He could not see through the portals of the tomb. He felt forsaken by the Father. But He submitted Himself to the Father in faith. We must remember that “He is the image of the invisible God, the firstborn of all creation. For by Him all things were created, in the heavens and on earth, visible and invisible, whether thrones or dominions or rulers or authorities - all things have been created through Him and FOR HIM... and in Him all things hold together”.1 Cor 1:14-17. Christ being the heir to all things would inherit Adam and his posterity and angels and all things. Adam was given dominion over a piece of territory and we know what happened. Israel was given stewardship over a piece of property; we know what happened. Lucifer, another created being was given authority; we know what happened. The begotten Son of God given a commandment to redeem what Adam lost of the begotten Son’s inheritance accomplished it perfectly. Isn’t that why God says “whatever is begotten of God (from above) overcomes the world”? Jesus told Nicodemus right off the bat “you must be born from above.” Nicodemus asked how that could be and Jesus told Him how the Spirit does it. Ezk 37 tells how the Spirit does it - the dry bones. We are to hear and understand God’s word as He speaks it to us, not as someone else understands it. Jesus did not know, since all His Divine attributes were laid aside, and He came to this world as each one of us does. His success is the same as ours would be if we exercised complete faith in God's Word, and lived within it's precepts. This is possible if we walk by the Spirit, and not by the flesh. This calls for a cross and the daily fight of faith to carry it always. We can achieve the same victory if we take His yoke upon us and learn of Him. This is following the Lamb wherever He leads. The redemption price is too high for an absolutely and totally human being in the flesh. That's false gospel! Kenny, are you saying it's possible for God to be killed on a cross? Do you think a member of the Godhead perished? God came in the flesh of mankind, the Seed the woman, as promised. There is no way for us to understand how this works, we only have the truth concerning the matter. Jesus was begotten by God, born in the flesh of fallen mankind, and in that body of flesh, died. Jesus lived as men live, and experienced the same physical limits/capacities we experience. Can't explain it beyond that. If God did not become fully man, we have no true Example to follow do we? If Jesus lived as God by His own Divine power, Satan would protest His sacrifice as invalid for sinners. Are we going to have free will even in new jerusalem? if so what are the chances that man will not start sining again? Holly, if freedom of choice is going to be removed in the new earth, why let sin have such a long run? Nahum 1:9 tells us God will not allow one who afflicts to rise again. This could mean a couple of things. God foresees no one will choose to sin again, or if one does sin, judgement will be swift with the approval of all loyal creatures, and not allowed to reign unchecked again. This is the first outbreak of sin and it had to be seen for what it really is due to the deception involved and the lies promoted. Very interesting. Now, who created sin? how does sin came to heaven and infected Lucifer who then became Satan? God as the Creator surely wanted to create a perfect creation including Lucifer. Thus, surely sin is not from God, so from where is the sin? Cannot be from Lucifer since Lucifer is the creation of God. Have a think about this: God created intelligent beings who have the power of free choice. (If he created beings without free choice then they would not be intelligent) If the created beings have the power of choice then that means that they have the ability to choose good or evil. It is their choice and if it is their choice it is their responsibility, not God's. I have this idea in mind that God could either create intelligence (with free choice) or not create at all. It is also worth considering that in the grand scheme of things, God knew the consequences of what he was doing and provided for it. Lucifer in exercising his free choice did not foresee the consequences of his action. Odrich, sin is the result or symptom of choosing to exercise unbelief. So sin is "created" in every action of unbelief. We each create our own sin, and cannot be guilty for the sin of another. Now the good news is that sin can be taken away! I shall answer your question "why did God create Lucifer?" with a similar question "why did God create any angel?" with the risks involved. In one sense the question is unfair because the questioner is unwittingly alluding to this question "why did God create Satan?" Below is a quote from Chris Blake in his book "Searching for a God to Love"
"Our doubtful questions about God and to God can take on a surreal quality. Are there any questions that God cannot answer? All nonsense questions are unanswerable:" Here is one of them . "How can I live forever without plugging into the Source of Life?" It is not God but Satan that did this to you. He's done it to all of us, me included. God is the one trying to save us, he's proved it at calvary. Don't let Satan win by doubting God's word. God is love. God is not God of possibilities and chances NO!! He is the all knowing God,he is not the human being who deal with possibilities and chances by false predictions,God see the beginning to the end,that why we have prophecies in advance,to tell us the realities that are to take place,NO POSSIBILITIES WITH GOD BUT REALITIES IN THIS CASE. I've no doubt that the same thing can be said about the creation of Lucifer.